On Aug. 21 the genocidal regime of Bashar al-Assad murdered over a thousand civilians, mostly women and children, with sarin gas in the Damascus suburbs of Eastern Ghouta. It committed this crime in full view of the world–images of hundreds of murdered children, still in pajamas (the attack came at 3 AM), laid out in temporary morgues, shocked viewers across the world. For a moment many in Syria felt hopeful. But far from the briefly threatened U.S. or French military strikes, which were pre-announced to be minimal and “not game changers,” the U.S. and Russia ended up proposing a deal whereby Assad would turn over his supplies of chemical weapons and in turn be allowed a chance to stay in power. This deal underlines the great powers’ preference for “stability,” however brutal, over the relative threat of freedom and self-determination. Assad had indeed crossed a “red line” with his sarin gas attack, but the U.S. response was intended to send other messages. It was meant to convey that the Syrian “crisis” would be managed by the big powers, the U.S. and Russia. It was meant to tell other regional powers not to cross other lines, such as the development of Iranian (or Saudi) nuclear weapons, or perhaps an Israeli strike on Iran. Above all it was meant to tell the Syrian people that revolution wasn’t on the agenda. Opposition to the Syrian Revolution has been consistent, from the early days of Secretary of State Hillary Clinton terming Assad a “reformer,” through the U.S. refusal to arm the Free Syrian Army even as the Russians and Iranians armed Assad, to this joint effort to treat the revolution as a crisis to be managed. This was almost immediately accepted by Assad and his patron, Russian President Putin, and formalized by the UN Security Council. In fact, it was not a spontaneous gaffe but a deal that had been hatched in discussions between Presidents Obama and Putin at the G20 Summit in St. Petersburg the week before. Far from being clumsy, as many pundits tried to claim, this was an artful way to misdirect attention from the sheer unprincipled nature of such an agreement. The lack of principle was underlined by Kerry’s subsequent praise for Assad’s compliance with the UN Resolution. Apparently the images from Ghouta hadn’t been seared on his mind. The Syrian National Council, the external face of the revolution which has been promoted by the U.S. and regional powers, is being coerced and more or less subtly threatened to play along–the end envisioned being an all-parties peace agreement leading to a transitional government. Differences between the U.S., Russia, and other powers however mean that no actual solution is in sight. What has shown itself in opposition to the Syrian Revolution is the reactionary essence of the state-capitalist world as a whole. In struggling for freedom and dignity the Syrians have had to fight on many fronts; they have come into conflict with every reactionary force the world can muster. It is as brutal and unfair a burden as that borne by the Paris Communards of 1871 who also faced all the might of an oppressive old order. Nevertheless the struggle has continued. In liberated areas the Local Coordination Committees have continued to function. Peaceful demonstrations expressing the original goals of the Revolution are held across the country, including in areas still under regime control. The majority of Syrians continue to hold to the anti-sectarian, democratic ideals that brought millions out into the streets. The best elements of the FSA and armed opposition have maintained their relationship to the mass movement as a force for self-defense and self-liberation. Recent conflicts between the FSA and the forces of the al-Qaeda affiliate, the Islamic State of Iraq and the Levant, may help to clarify that relationship. As people are learning, one of the biggest lies is the saying that “one man’s freedom fighter is another man’s terrorist.” There is a fundamental distinction. The fundamentalists have clearly become an expression of counter-revolution, as much as Assad himself, if far less powerful. Their oppressive interpretations of Islamic law, attacks on demonstrators and sectarian massacres are serving to alienate them from the Revolution, to the point where many are chanting “One, one, one; the regime and al-Qaeda are one!” Women have been active in opposing these forces. Al-Baghdadi is the head of the ISIL, which has often come into open conflict with the FSA. Far from carrying on a revolutionary struggle, the group’s campaign in Syria has come to mirror its terrorist campaign in Iraq. It is only geared toward seizing territory for its own purposes, and can only do so because so many are displaced from their homes and vulnerable. As in Afghanistan after the 1980s war, as in Somalia or Mali, al-Qaeda would like to function as an occupying army. Residents of Raqqa, for example, have been resisting ISIL oppression by continuing the revolution, including through anti-sectarianism: when a cross was pulled down from a church, demonstrators lifted it back into place. Youth have openly published calls for love and brotherhood among all religious and ethnic groups. This struggle against counter-revolution arising within the revolution is part of a challenge to the religious fundamentalism that arose as a world stage of reaction in the 1980s. It is one of the most profound outgrowths of the Arab Spring. Similar struggles are ongoing in Tunisia, Egypt, Sudan, Turkey and Iran. The Iranian people’s rejection of its own rulers has led Ayatollah Khamenei and newly elected President Rouhani toward negotiations with the U.S. As with the Egyptian military coup, this is an attempt to head off a more radical mass movement. 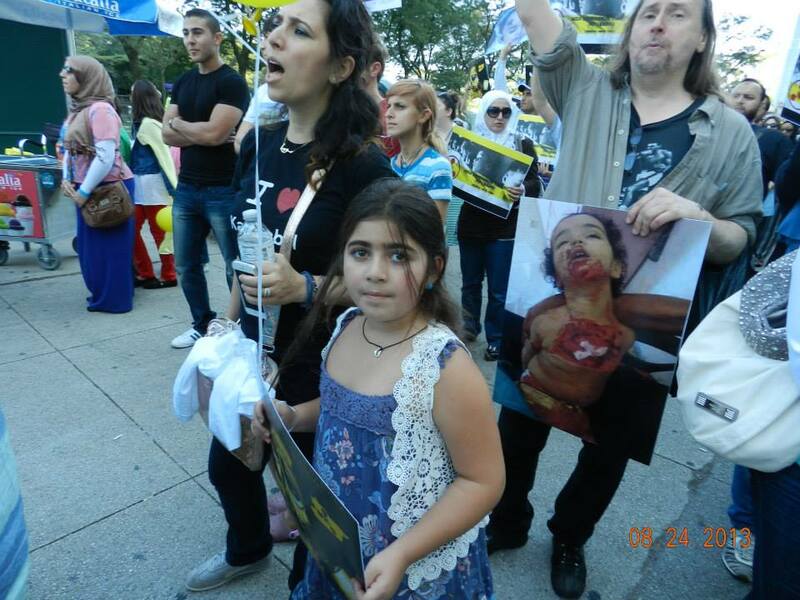 Demonstration in Chicago, Aug. 24, 2013, shortly after Assad used sarin gas on civilians killing over a thousand. These struggles are not separate from that of the Black and Latino masses, women, and workers here in the U.S. against the Tea Party reactionaries and obscurantists. It is a worldwide movement. 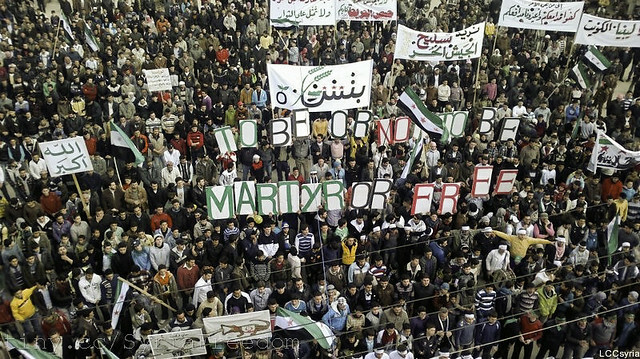 The Syrian Revolution, from the beginning, has been world-historic. All powers have had to respond to it, and all revolutionaries have had to do the same. At the moment that it seemed like the U.S. might actually launch some extremely limited strike on Assad’s forces, there was a rush by many “peace” activists to scream “Hands off Syria!” without acknowledging that the Syrian people are fighting a revolution against a genocidal fascist state. Such one-dimensional politics have deadly consequences. In Chicago, a Syrian government-aligned organization led a demonstration with a banner saying, “There are no peaceful demonstrators in the streets of Syria only insurgents.” Even some Leftists who profess to support the Syrian Revolution fell in line behind this vile lie, this apology for genocide. At its worst, this attitude led some to align with the Tea Party and other reactionaries as if the radical Right was an anti-war option, rather than the seed of future genocidal imperialist world wars. It has also led some to echo old racist ideas: the rebels are cannibals! If the majority gets power, it will massacre the ruling minority! We’ve heard all this before. Failure to understand the fundamental hostility of imperialism toward revolution indicates a failure to understand the nature of reality. “Revolutionaries” who take this path will become reactionary misleaders of future generations. The shadow dances of reactionary state powers–most recently seen as the refusal of the Saudi rulers to take a seat on the UN Security Council, which has nothing to do with Syria and much to do with rival Iran–and the failure of so much of the Left can’t be the ground for revolutionaries now. This is the concrete expression of a hard universal truth. Revolution will only come through the creation of new human relations. Those who can’t see the dead of Ghouta, who can’t hear the insistent voices of Syrian freedom fighters, will have nothing to contribute to the creation of a new, human society. Marxist-Humanists stand in solidarity with and support of the freedom struggle in Syria. We see this revolutionary moment as the test of world politics, which could very likely determine the next stage of history. This entry was posted in Articles and tagged al Qaeda, Al-Baghdadi, Aleppo, Ali Khamenei, ANA New Media Association, Arab spring, Barack Obama, Bashar al-Assad, Ben Allison-Davies, chemical weapons, counter-revolution, Egypt, Free Syrian Army, Ghouta, Hassan Rouhani, Hillary Clinton, Iran, Islamic fundamentalism, Islamic State of Iraq, Islamic State of Iraq and the Levant, John Kerry, Local Coordination Committees, Middle East revolutions, political Islam, Rami al Razzouk, Raqqa, Russia, sarin, Saudi Arabia, Sudan, Syria, Syrian civil war, Syrian National Council, Tea Party, Tunisia, Turkey, UN Security Council, Vladimir Putin, women's liberation. Bookmark the permalink.